Not long after I started this blog I decided to stop reviewing books because I wanted to be a writer, not a book reviewer. But sometimes a book comes along and moves you in a way you never expected. Then you HAVE to share it. I have to be honest, when a dear writer friend told me about this book, I thought Eh, I probably can't relate. You see the book is about an obese teenage girl (5'6" and 300lbs) struggling with her weight. Me, always been skinny and athletic, couldn't imagine I would enjoy a book like this because...I probably can't relate. This book touched something deep inside me. I wish I could give this book to teen me and every teen in the world. Yes this book is about a girl struggling with her weight BUT its so much more. 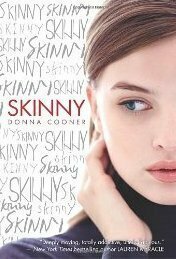 Skinny is the negative voice inside Ever's head that whispers all the hateful things she feels from being overweight. As it says on the Amazon book description "This story will appeal to girls who struggle with doubts and fears, whether dealing with weight issues, loneliness, or lack of popularity." Every teen has a little voice inside their head that tears them down. Some voices are louder than others. It wasn't until a few years ago that I even realized I had this negative voice inside my head. The most painful thing I learned was the voice was my own, but in learning this, I realized I could control it. Through a lot of therapy and the self help book "Self-Esteem" by McKay and Fanning, I learned how to recognize the negative voice and shut it off. This is what Ever does as well. This book shows teens that they have the power to control what goes on in their heads. It's about the only power we do have. Just like Ever, set your eyes on the prize and figure out how to get there. It's not an easy road and we'll make mistakes along the way but eventually, we can find that inner peace. If you know a teen that has self-esteem issues, this book could give them a light of hope. This sounds like a very powerful story and not just for its intended audience.